(John Wiley & Sons, ISBN 0471644102), in multiple translation. Competitor Targeting shows how to increase the share of a customer's business over the customer's purchasing lifetime. As its name suggests, Competitor Targeting describes how to beat competitors by winning one customer at a time and how to triumph in the marketplace. Competitor targeting is defined as the process of identifying specific competitors and creating a strategic and tactical offence against them in order to increase your own company's differentiation, market share, and shareholder value relative to others in the industry. Competitor Targeting shows where, when and how to beat or collaborate with competitors and how to do this while improving customer relationships. For the first time, the book introduces the issue of competition into the development of customer relationship management (CRM) initiatives to help ensure that CRM creates competitive advantage and new shareholder value. 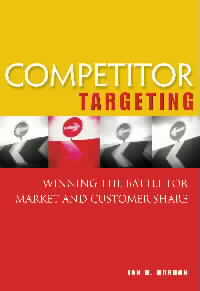 This book describes in detail how to manage customer relationships and competitors. It is the first book to provide a competitive context into CRM and to detail competitive strategies in this era of marketing to individual customers. It should be of great interest to companies wanting to supercharge their CRM initiatives and revitalize sales and profits in softer markets. In today's increasingly competitive business environment, understanding and beating competitors is more challenging than ever before. The complexity of the current marketplace demands flexible and quickly executed strategies in order to gain customer loyalty through superior customer relationships. These strategies must be carried out at the expense of defined competition, directly challenged one customer at a time for customer share and, in aggregate, for market share. Competitor Targeting provides the tools necessary to wage and win the business war. focus customer relationship management (CRM) initiatives on competition as well as customers. There is often less potential in today's markets for a company to operate under the live and let live philosophy. Now more than ever, survival of the fittest applies to the corporate landscape. Those fleeter of foot, sharper of mind, better armed and better supported earn the right to live and fight another day and to evolve to a higher and yet more profitable state. Competitor Targeting provides a roadmap for winning strategically, tactically and in real-time to increase market share and customer share. Ian Gordon's latest book is another first! It is the first book to focus competition in each customer account! It adds enormous value to the popular area of CRM or one to one marketing. A well structured, informative view of how competitive intelligence can be used to better target preferred customers to improve the bottom line. The winning of customer and market share is becoming increasingly difficult in business today, and winning the right sort of customers from ever more aggressive competition is even harder. This book will help you understand the many issues involved and help you formulate appropriate strategies to improve business results. The new marketplace challenge of observing competitors' practices and combining relationship marketing strategies has been made practical by Ian Gordon's new book. A must-read for any marketing professional. In the fast-paced new economy, Competitor Targeting can help leaders maintain their market share and can allow the underdog to chip away at the gorilla's foothold. The techniques and insights in Competitor Targeting on how to weaken a competitor's chain of relationships, take uncontested territory, operate below the radar, and anticipate an attack from your competitors can allow a company to gain key insights, strengthen its position in the marketplace, and ultimately win more business. In an era in which competitors are often in the same channel or alliance as your own company, identifying and defeating those competitors has never been more complex. As Competitor Targeting demonstrates, competitive intelligence has evolved from simple information gathering into a sophisticated discipline. Practised as Mr. Gordon outlines, it will enable you to defeat your competitors, not only by learning more about them, but by understanding and responding to what your customers-who are your competitors' customers-value most about them. Gordon provides an essential framework for understanding the nature of competition and competitors. It will equip you to make your company more profitable. In this rapidly changing world, it is imperative to not only make your critical customers the key of your focus, but you also need to target intense competitors, old and new, as perceived by those very critical customers, in order to win in the marketplace and thereby raise shareholders' value. Ian Gordon gives you a no-fail step-by-step approach to succeed in this endeavor. Why should you read this book? For CRM, it offers not only strategically relevant models but also practical solutions. And it reinforces that you share your customers with your competitors, so that it is imperative that you focus on both. Competitor Targeting takes CRM to a new level. This is the first book on CRM and competition and a worthy successor to Relationship Marketing, Gordon's previous ground-breaking book. Competitor Targeting encourages companies focused on individual customer relationships to also manage competitors. Gordon shows, step-by-step, how to do this strategically, tactically, and in real-time, with practical road maps and instructive comments.